Furthermore, she had complained of the issue before with her previous workstation before it was swapped out for the current one so I also decided to look at her previous workstation and noted the same daily errors. Both workstations were of the same model. With that, I decided to setup Event Forwarding for this error and saw that ALL workstations of the same model were reporting the this error. Some quick research pointed me to a known issues with the Intel Array Storage Technology (aka Rapid Storage) and SSDs that do not support one of its features known as Link Power Management. Go to HKLM\System\CurrentControlSet\Services\iaStor\Parameters\Portn, where n=the hard disk (often Port0 for the primary storage). If the key Portn does not exist, create it*. Create the following DWORDS with a value of 0: LPM, LPMDSTATE, DIPM. Since we have hundreds of these, a group policy preference was used to target the PC model hard drives affected (via wmi query) and push the reg hack firm wide. Afterward applying, the errors went away. *The existence of the Portn key depends on the driver version of the Intel Array Storage driver. Version 10 and higher does not require the existence of the keys and values to enable LPM, only to disable. 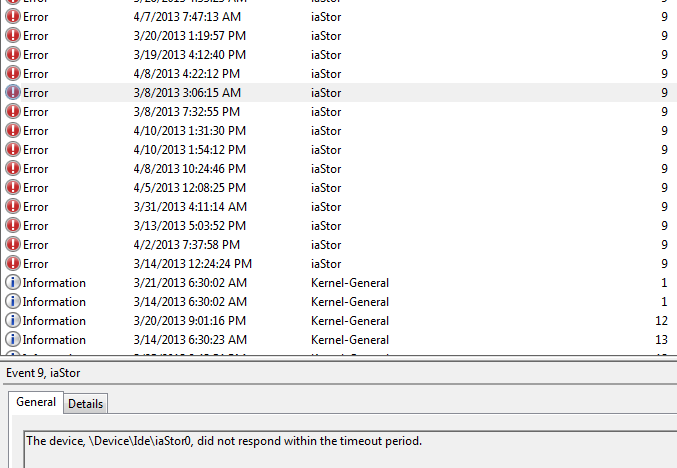 This entry was posted on April 26, 2013 at 6:08 pm	and is filed under Troubleshooting. Tagged: Performance. You can follow any responses to this entry through the RSS 2.0 feed. You can leave a response, or trackback from your own site.